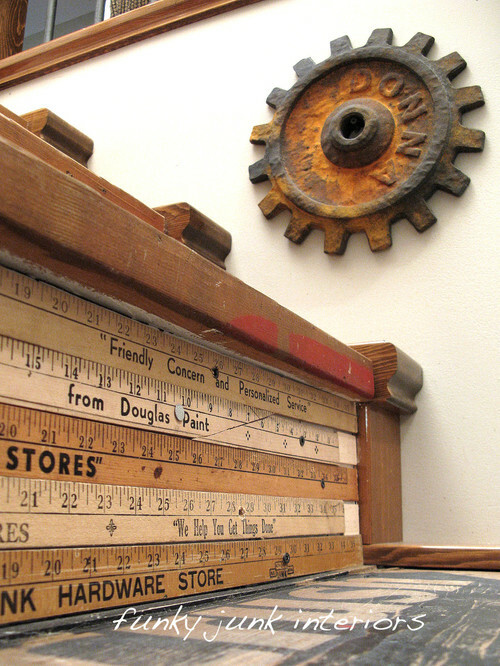 Yardsticks and rulers always seem to be a magnet to us junkers. I'm not sure what it is, maybe the numbers or the color of the wood. 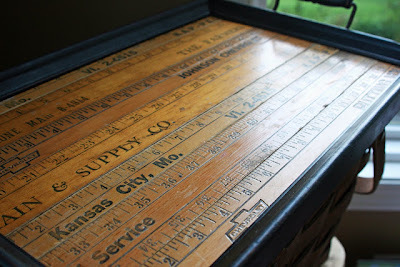 I am always on the lookout for yardsticks that have a local business I knew as a child (I live in the same town I grew up in) or great patina. Right now I am collecting them to line shelves in my work room. Last Thursday I was up at Ruby Rose buying tickets for Remnants of the Past Antique show and lucked out in finding one that was 48" long instead of the standard 36". That size will work great on the shelves. 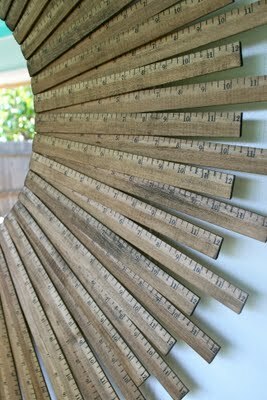 I have gathered some images of ruler and yardstick projects, most are hand crafted and some even have a tutorial. I can definitely see some I would like to make...starting with number one. 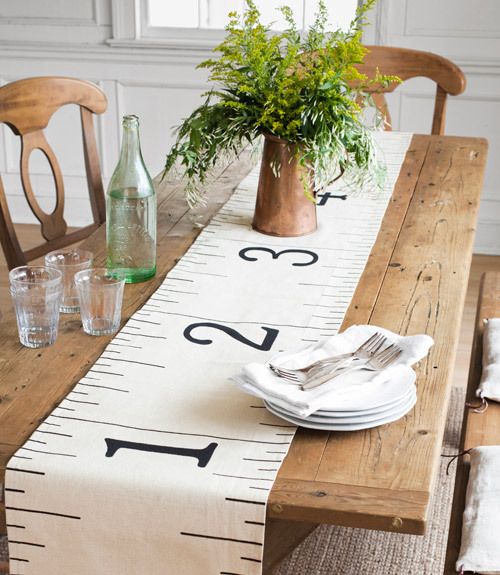 I have already counted, there are 39 yardsticks that make up this fabulous piece. Enjoy! I would love to know what you have used rulers or yardsticks for! I haven't used rulers or yardsticks in creative ways before...but my goodness, thank you for some awesome ideas! I LOVE the staircase!! Great collection! I am addicted to these too - my only rule is that they have to have the 'old' style phone numbers. I love them! shelly, I like those old phone numbers too. I have favorite one right now that has stars on it. love it. Lee, now that brings back some memories. Grade 6, Jim A. would not stop talking. Teacher walked right over and whacked his desk so hard to get his attention that her yardstick broke in half. Oh boy...that got everyone's attention. I personally think that boy alone sent her into retirement that year, lol. Good times! 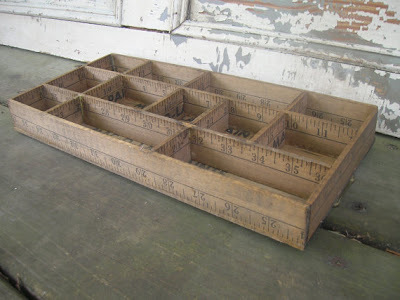 I thought I was the only one who LOVED yardsticks! I have not done anything with mine and I LOVE your ideas. Thanks so much for sharing and letting me know I'm not alone. tee hee. 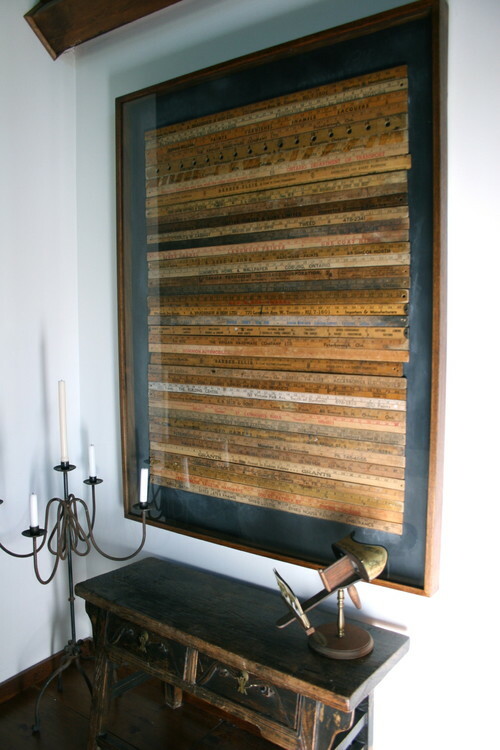 I have a whole Pinboard devoted to things you can do with yardsticks. :) I bought a great old table at the thrift store that has an inset top. 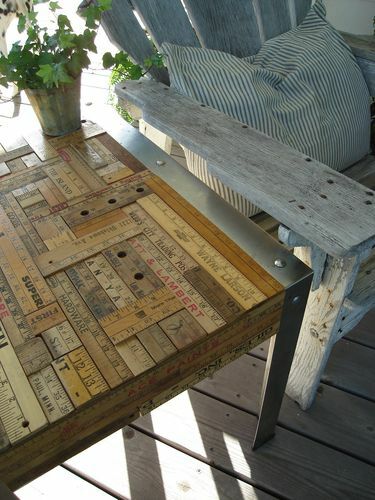 I want to refinish the table and fill the inset portion with beautiful old yardsticks! I'm always on the hunt for them at estate sales and get particularly excited when I can find a painted one! love the idea heidi...I want a picture when it's done...even if it's a year from now! Love all these ideas. I too am addicted to vintage yard sticks and have a few. Would love to create something with them one day. Just picked up my newest folding one last week. Thanks for the ideas Paula. 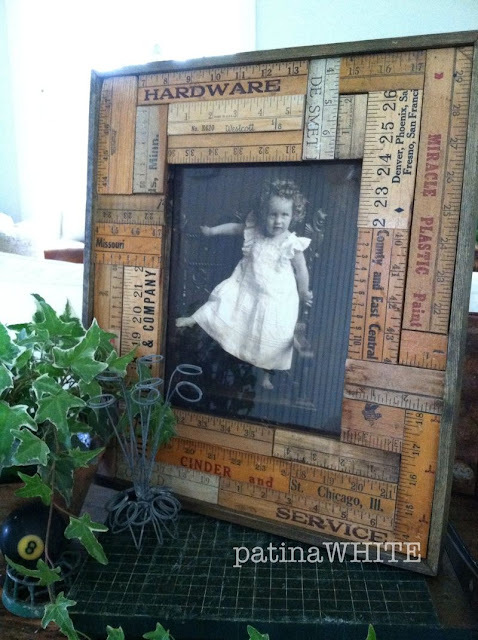 I totally love these pictures.I knew I was collecting yardsticks for a reason. I have to ask, where do you find the yardsticks at? Okay. I want all of these items in my house, right now. And I'm not a pushy person....I'm really quiet. But I'm afraid that I have elbow my way in here, ladies. Sorry. I find mine at local antique stores...I usually pay between 5 and 10 for each one depending on the store. Anything over 10 is a no go! I did have a nice collection but only have two now as they have disappeared over the years! I also have one that can be closed up. Maybe I better hide the couple I have! WOW,love all the ideas but the stairs take the prize. How absolutely cool and different and FUN!!! I should be so talented. Thanks Paula for sharing the wonderful ideas. Connie, I want to see it when it's done! 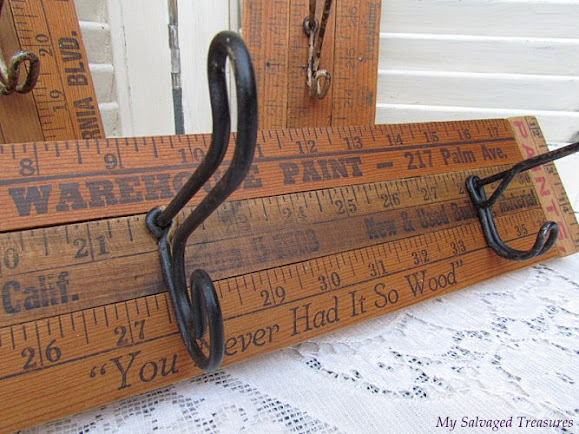 Love this ruler/yardstick post. So creative! Love all the photos of the rulers! 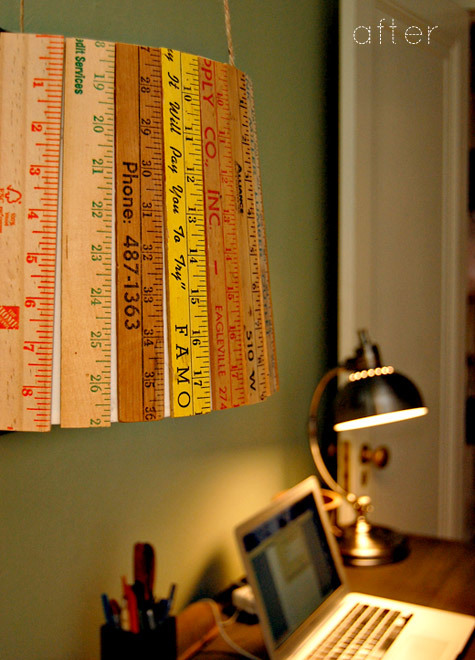 and of course I LOVE rulers! Great post as always!! I love yardsticks! Thanks for sharing some fabulous ways to use them. I love all of these ruler creations! I'd better keep my eyes open for yardsticks from now on. Still using them for measuring here! Amazing ruler art! The staircase is absolutely wonderful! I'd seen the framed rulers before, and the drawer caddy, but never the furniture!!! WOW!!! My mind is buzzing with ideas! I love this! Thank you for sharing!!! !